Do you have a basis for pride? What is your source of that pride? Paul reminds us that our one, true, and dependable source of boasting is boasting in what the Lord has done for us on the Cross. This one source of boasting has absolutely nothing to do with anything that we have done, attained, or accomplished on our own. All other reasons to boast are fleeting glimpses at hollow fame compared to the joy and assurance of sharing in Jesus' life, death, and resurrection. Forgive me, O Abba Father, for the times I have thought myself important because of some transitory accomplishment. 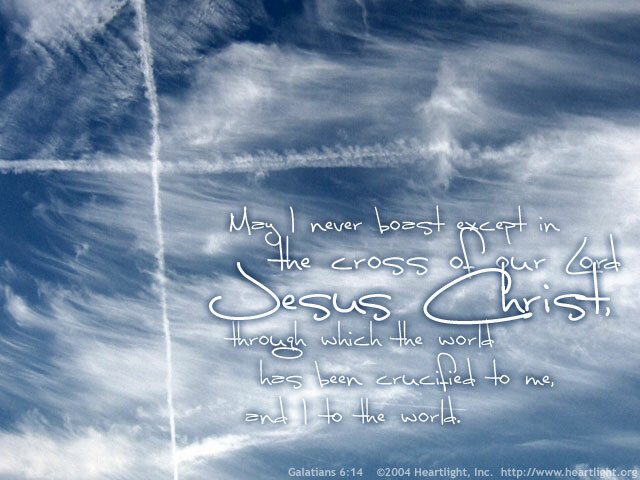 Thank you for giving me a bedrock source of boasting in Jesus' love and grace demonstrated in the Cross. In Jesus' name I thank you. Amen.